Toby Keith Covel is one of those bad boys of country that eventually turns things around. A relative latecomer to the scene in that he didn’t start recording in earnest until his early twenties, Keith is famous for rowdy album titles that sound like hip hop bravado but he’s a work in progress rather than just a piece of work. His album sales exceed 40 million worldwide and he’s notched up an impressive range of number ones in the long form and singles charts. His list of awards is no less impressive whether at the American Music Awards, the CMA or the Academy of Country Music. He also backs up his image by doing good philanthropic work for the underprivileged and for children with cancer and while he’s famously a patriot he doesn’t necessarily foist his views via his music and may in fact be apolitical by nature, as he gets older. Our catalogue is packed with Keith’s best work – from the earliest successes like Pull My Chain through to the classic crossover American Ride. A far more esoteric act than his cowboy hat image suggests - he’s worked with Willie Nelson and Sting – Keith is a wealthy man with a wealth of talent. Just for good measure Mr Keith has appeared with honour in two movies – Broken Bridges and Beer for My Horses and owns the restaurant franchise I Love This Bar and Grill as well as a successful clothing range. You could say he is the Jay-Z of country music. Or you might better say he is the one and only Toby Keith. Hailing from Clinton, Oklahoma and raised all around the mid-South, Toby Keith was more likely to have been a football player or an oil man than a successful country artist but when those other avenues petered out he returned to his love of the honkytonks and wound up peddling demos in Nashville where Mercury Records man Harold Shedd liked what he heard. His self-titled debut album (1993) was preceded by the single 'Should’ve Been A Cowboy' which not only went to number one, it also became the most played country song of the decade, followed up the charts by 'He Ain’t Worth Missing', 'A Little Less Talk and a Lot More Action' and 'Wish I Didn’t Know'. Suddenly the whole of America was buzzing on this new talent and he matched his promise on the debut with Boomtown (1994) and Blue Moon (1996) from whence 'Me Too' soared to the top again. Backed by hotshots like Sonny Garrish, Reggie Young and Brent Mason, Keith’s canny fusion of female friendly ballads with a surprisingly sensitive inner core that also allowed his road band Easy Money to shine. Dream Walkin’ is a tad more pure country in flavour with plenty of steel guitars to drive his muse along. The title track and his Sting cover, 'I’m So Happy I Can’t Stop Crying' (which features the latter on bass and vocals) gave notice that Keith was in it for the long haul and so it proved. His tougher new sound begins to emerge on 'How Do You Like Me Now?! ', 'Country Comes to Town', appealing to the blue-collar American heartland where buyers hankered after a man’s man. We’re particularly keen on Unleashed (2002) since it includes the gloriously over the top 'Courtesy of the Red, White and Blue (The Angry American)' – a US troops overseas favourite, as well his duet with Willie Nelson, the gallivanting 'Beer For My Horses' – a bar room favourite in anyone’s money and his biggest Number One hit. But listen beyond any rhetoric and you’ll hear a decent man dealing with real life problems as well as big issues and also making darn sure the music fits the picture. 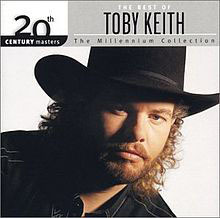 Right up in the country stratosphere now we mention his 20th Century Masters – The Millennium Collection: The Best of Toby Keith. The ideal introduction to the man and his work this 12-cut wonder is a massive seller in its own right and if it’s the hits to date you’re after you will find them stacked up and ready to go right here. Back to on going business we find Keith bossing his patch on the excellent Shock’n Y’all (2003) – one of the great modern drinking albums. Now casting himself as a somewhat rebellious and rowdy version of the old school Outlaw brigade of country renegade, Keith manages to revel in and debunk his perceived image as a redneck (he patently isn’t) while sending himself up on occasion though he’s never been afraid to take the bull by the horns – witness his infamous run in with the Dixie Chicks. 'I Love This Bar', 'Whiskey Girl' and 'American Soldier' cover one side of his waterfront but the funky 'Sweet', 'Baddest Boots' and the hilarious 'The Critic' all cause a different stir. A bit of confrontation is to be welcomed in any sphere of music and if sometimes Country steers clear of too much controversy it doesn’t when Toby’s in town. Once he’s graduated from Honkytonk University and gifted the world the fine White Trash with Money (2006) we’re on his case again via Big Dog Daddy (2007). Hardly mellowed but still kicking over the traces with a smile this self-produced outing on his own Show Dog Nashville imprint includes some of his finest songs to date – namely 'High Maintenance Woman', the fast and funky 'Get My Drink On' and the clever wordplay of 'Wouldn’t Want to Be Ya'. With one of his acclaimed Christmas albums and a Greatest Hits in the bag Toby’s right on it with That Don’t Make Me a Bad Guy (2008) where he continues to utilise his tried and trusted specialist players as he returns to the ballad form that suits him just as well as his roughneck side. That fact is borne out by the hits within: 'She Never Cried in Front of Me', 'God Love Her' and 'Lost You Anyway' have got just the right amalgam of tear jerkin’ and chain jerkin’ to make them real. 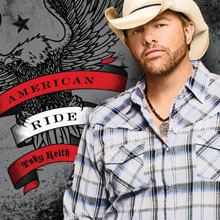 Our journey with Toby Keith arrives at 2009’s American Ride which again contains the proper blend of swagger and sweetness that make sure this artist stands out of the crowd. He rocks his own mythology on 'Loaded' and 'Cryin’ For Me (Wayman’s Song)' – the latter a poignant tribute to jazz musician and basketball player Wayman Tisdale - and generally delivers his usual strong and touching performance. With his penchant for the masculine and the colloquial it’s too easy to see Toby Keith as a myopic tub-thumper but we hope you’ll have realised by now that he’s a far more rounded and gifted artist than that. His albums contain food for thought, plenty of opinion and a whole load of ace country playing and memorable song writing. Needless to say this album hit number one again. So, maybe he shoulda been a cowboy but we’re mighty glad he became a country star. A damn good one at that. 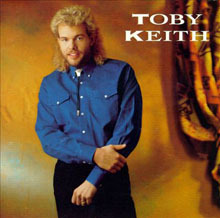 On the cover of his eponymous 1993 debut, Toby Keith doesn't quite look like the big, swaggering dog that became a superstar roughly seven years later -- he's too thin, his shirt too crisp, his mullet too drastic, his smile too eager -- but image isn't everything. Underneath that cover, it sure is possible to hear the roots of modern Toby Keith on this appealing debut. It is given a production that's a bit too big, clean, glossy and cavernous for Keith's good -- it fits the outsized sound of early-'90s radio, but not his outsized talent -- but beneath that sheen the songs are very strong. He wrote all but two here -- the cheerfully swinging "Some Kinda Good Kinda Hold on Me" and the very good "A Little Less Talk and a Lot More Action," which winningly echoes the Georgia Satellites' "Keep Your Hands to Yourself," aren't his -- and he's already showing considerable range as a writer, already revealing his wry sense of humor on "Close But No Guitar" and expertly playing of Western mythology on "Should've Been a Cowboy" which was his deserved breakthrough. But if that song, combined with his latter macho stance, suggests that he was always all outlaw, most of Toby Keith is surprisingly within poppier territory, as "Ain't No Thang," "He Ain't Worth Missing" and "Wish I Didn't Know Now" all bear influences from Ronnie Milsap. He'd later develop this influence, blending it to a rowdier stance that became his signature, but looking back on this debut it's clear that Keith was a writer and singer of considerable skill even at the outset of his career. 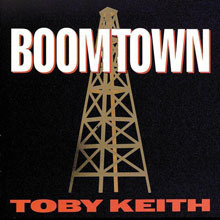 With a disclaimer stating that he only had a year to write the songs for his sophomore album (while he had a "lifetime" to write those for his first), Toby Keith introduces us to his second effort, Boomtown. Not to worry: he pulls off a successful follow-up to his hit-heavy debut. His songwriting has matured, and his vocals still stand out as one of the predominant male voices of contemporary country. Keith straddles the wall between traditional and pop, and he maintains a steady balance. Opening with his number one song "Who's That Man," Keith immediately packs a traditional country wallop. His songs tell stories about everyday life and working-class people, and the serious issues they face like divorce, adultery, teenage angst, aging, love, and life in an oil boomtown. But Keith does occasionally detour the heady issues and lightens the mood with songs like "You Ain't Much Fun" ("...[since] I've sobered up") and his rocking tribute to female truck drivers, "Big Ol' Truck." Being a former oil man, himself, Keith's Boomtown saga gives the roughneck tale a stamp of authenticity. Toby Keith need not worry about running out of ideas. If he can create Boomtown in a year, he has a bright future. Long before Toby Keith rose to fame as the boot-brandishing "Angry American" of post-9/11 country music, the Oklahoma native was a well-regarded performer who regularly appeared on the charts, but hadn't yet gained mainstream superstar status. On this 1996 outing, Keith, backed by his Easy Money Band, offers up a largely romantic set. "Me Too" finds him calling in sick to work just so he can stay home with his lady, while "A Woman's Touch" features the singer pondering matters of the heart over gently twinkling keyboards, and "Does That Blue Moon Ever Shine on You" stands out as a particularly tender, if not schmaltzy, ballad. In fact, aside from the upbeat tunes "She's Gonna Get It" and "Hello," the record is a notably downtempo affair that calls attention to Keith's resonant vocals. A far cry from his rowdy, hard-drinking later albums Unleashed and Shockn' Y'All, Blue Moon showcases the sensitive side of Keith to charming effect. 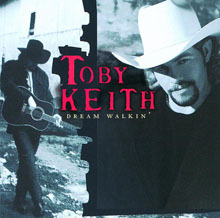 The very title of Dream Walkin' has a hazy, laid-back quality, which is rather appropriate since this, Toby Keith's fourth album, comes from the close of his time at Mercury Records, when he was singing more ballads than rockers and when he was cutting nearly as many covers as he was originals. It was all part of an attempt to have Keith fit within the country music machine and he's good enough of a ballad singer to have this work well, although the tunes not written by Keith -- "We Were in Love," Sting's "I'm So Happy I Can't Stop Crying" -- don't showcase his underrated, understated subtle singing as well as his original ballads, which have a nice sense of grace. Similarly, the wannabe swagger of "Double Wide Paradise" doesn't have the snap of Keith's own livelier material such as the rip-roaring "Jacky Don Tucker (Play by the Rules Miss All the Fun)" and the refurbished Western swing of "I Don't Understand My Girlfriend," both of which go a long way on Keith's outsized humor, or his excellent "She Ran Away with a Rodeo Clown," which plays like a deserved tribute to Moe Bandy. There aren't many of these livelier tunes here -- enough to make an impact, enough to make you wish there were more, but even if this is heavy on the smooth stuff, Dream Walkin' rides its mellow vibes in an appealing fashion. 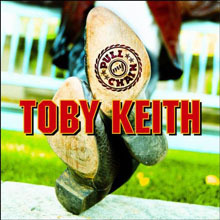 Toby Keith's first DreamWorks album, 1999's How Do You Like Me Now? !, unveiled a new persona -- one that didn't shy away from the ballads that helped bring him hits in the '90s but put them into the background, emphasizing his humor and his bravado to winning effect. And to success, too, as it became the album that truly turned him into a country star, thereby letting him dig into this new persona on its follow-up, 2001's Pull My Chain. In every regard, this is a bigger, better record than its predecessor, possessing a richer musicality and a more confident sense of humor. That humor may be most evident on its weakest track, the mocking macho white-rap "I Wanna Talk About Me" (written by Bobby Braddock, not Keith), but it's better heard on the album opener "I'm Just Talkin' About Tonight," a one-night stand anthem that's wry and clever, not obvious. That sly sense of craft has been evident in Keith's work since his debut but it truly comes to full fruition here, perhaps because of his new co-writer Scotty Emerick, who had only one credit on How Do You Like Me Now?! but five here, including "I'm Just Talkin' About Tonight," the mellow soul of "I Can't Take You Anywhere," the power ballad "You Leave Me Weak," the breezy '70s soft rock of "Tryin' to Matter" and the laid-back "Yesterday's Rain." These are the backbone of the record, but they don't dominate it, as Keith's collaborations with Chuck Cannon -- "The Sha La La Song," which is the opposite of the bluster of the title track, also written with Cannon -- a rocking cover of Dave Loggins' "Pick 'Em Up and Lay 'Em Down" and two collaborations with Elton John's lyricist Bernie Taupin (the ballad "You Didn't Have as Much to Lose" and the bonus track "Gimme Eight Seconds," which is pure arena rock country complete with guitars resurrected from the '80s) are equally as good. All these different co-writers and covers mean that Pull My Chain isn't quite coherent, but that's also part of its charm: with his new success, Keith is empowered to try a bit of everything, to sow his wild oats, and he does so in compelling fashion here. With most contemporary country artists, you could guarantee that a song called "American Ride" would be a slice of jingoism, but Toby Keith isn't like most country singers. His "American Ride" casts a cynical eye at desperate housewives and wannabe pop stars, not celebrating down-home values but wondering where we're all headed on this American Ride at the end of the 2000s, a sentiment not all that far removed form some of Keith's previous social commentary, which makes it a mild surprise that it is the only song here that doesn't come from his own pen. As superb and striking as it is, it's not necessarily a good keystone for the rest of the record, which does have a few tougher numbers that pick up on the lean, mean vibe of 2008's That Don't Make Me a Bad Guy -- "Every Dog Has Its Day," the sly "If I Had One," and the heavy blues stomp "Loaded" -- but spends more time on the softer side, even when he kicks up a bit of dust on the dancefloor on "You Can't Read My Mind" or does a funny, respectful salute to military life on "Ballad of Balad." In other words, the real touchstone for the rest of the record is "Tender as I Wanna Be," where he lets his guard down and lets the romance flow. This doesn't turn American Ride into a schizophrenic jumble, as Keith has always balanced these two extremes, but after spending a little bit more time swaggering than wooing, he's back to crooning and it's amiable and appealing, if not overwhelming. 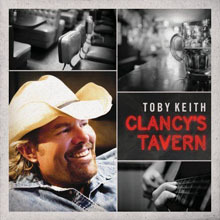 Discounting its lumbering opener “Made in America” -- an ode to middle America disconcertingly scored to echoing guitar copped from the Edge -- Toby Keith plants his flag firmly in the country on Clancy’s Tavern. Modern man that he is, Keith’s definition of country is rooted in ‘70s outlaw, but not beholden to twangy Teles and slow-rolling acoustics -- he opens up enough to allow a Caribbean breeze to blow in when he’s taking a moment to “Chill-Ax,” he croons sweetly on “Just Another Sundown,” he even leans on a little melancholic Irish lilt on the title track, just one of many drinking songs on an album named after a bar. Keith measures his memories by beer and hoists a “Red Solo Cup” in a riotous party that goes a long way in explaining what’s right with Clancy’s Tavern. Following through on the lighter touch of the preceding Bullets in the Gun, Keith pushes humor to the forefront and generally isn’t so insistent on driving the beat into arena country territory, letting the melodies and music relax. Similarly, his delivery is unassumingly assured, sounding almost sly when he’s singing about his need to hear a country song and retaining some spooky mystery on “Club Zydeco Moon” (which strangely enough never flirts with Cajun music). Keith is no longer in the flashy phase of his career, and he’s toning down the bravado somewhat -- he’s now the guy he sang about being on “As Good as I Once Was” -- but he’s settled into this well-weathered skin on Clancy’s Tavern, winding up with his best album in many a moon. 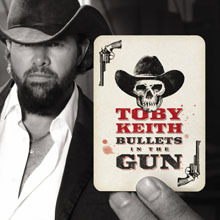 Toby Keith didn't become a crossover superstar until 2002, when his post-9/11 anthem "Courtesy of the Red, White and Blue" made him a household name, but by then, he had been a country star for nearly a decade, constantly reaching the upper heights of the country charts while on Mercury. That's the era covered on 2003's 20th Century Masters: The Millennium Collection: the years between his 1993 self-titled debut and his 1997 farewell to Mercury, Dream Walkin'. This does its job perfectly, containing all of his big hits from this era, including "Should've Been a Cowboy," "A Little Less Talk and a Little More Action," and "Me Too." In fact, even though this disc has two less tracks, this mid-priced collection is better than 1998's Greatest Hits, Vol. 1 since it has no filler, all the biggest and best hits, and is presented in chronological order -- all factors that make this a near-ideal summary of Keith's Mercury recordings as well as a fine introduction to the man himself. For many mainstream listeners, Toby Keith first appeared on their radar in 2002 with "Courtesy of the Red, White and Blue (The Angry American)," the blistering counterpoint to Alan Jackson's sorrowful "Where Were You When the World Stopped Turning" that turned Keith into a talk radio phenomenon and a genuine American star. 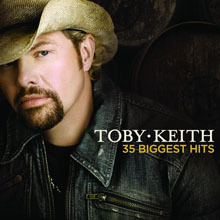 Like many overnight success stories, Toby Keith's celebrity didn't happen overnight -- it was the beginning of his second act, as the 2008 double-disc compilation 35 Biggest Hits makes plain. 35 Biggest Hits divides neatly into a disc of '90s hits and a disc of new-millennium singles, stopping with 2006's White Trash with Money (2007's Big Dog Daddy apparently falling under another contract and thereby absent from this comp) but adding the new recording "She's a Hottie," an OK rocker that feels like the contractual obligation it likely is. This split makes sense chronologically but it also makes sense musically, as Keith's '90s hits were much softer than his 2000s singles. 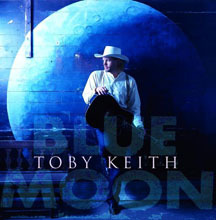 After establishing his modern-day outlaw stance with "Should've Been a Cowboy" and "A Little Less Talk and a Lot More Action" in 1993, Keith spent much of the '90s crooning ballads vaguely reminiscent of Ronnie Milsap's early-'80s hits (such as the lovely "Does That Blue Moon Ever Shine on You"), but when he jumped from Mercury Nashville to DreamWorks in 1999, his sound got bigger and tougher, eventually leading to the Waylon-indebted swagger of "Beer for My Horses" and "Honky Tonk U." Most musicians do their most adventurous work earlier in their careers, but 35 Biggest Hits shows that Toby Keith is the opposite, getting bolder and riskier as the years go by. Such a statement suggests that his earlier records weren't much good but that's not the case at all; he had loose-limbed barroom rockers like "You Ain't Much Fun" early in his career and all of the ballads are very good, showcasing a sensitive side that has been overshadowed by the outsized persona he's been working since Pull My Chain. Listening to 35 Biggest Hits, it's easy to appreciate how much Keith has changed over the years and how he's as good now as he ever was, making this a rather revealing career overview and an excellent introduction to a singer who, no matter how bright his star shines, still tends to be a bit underrated.